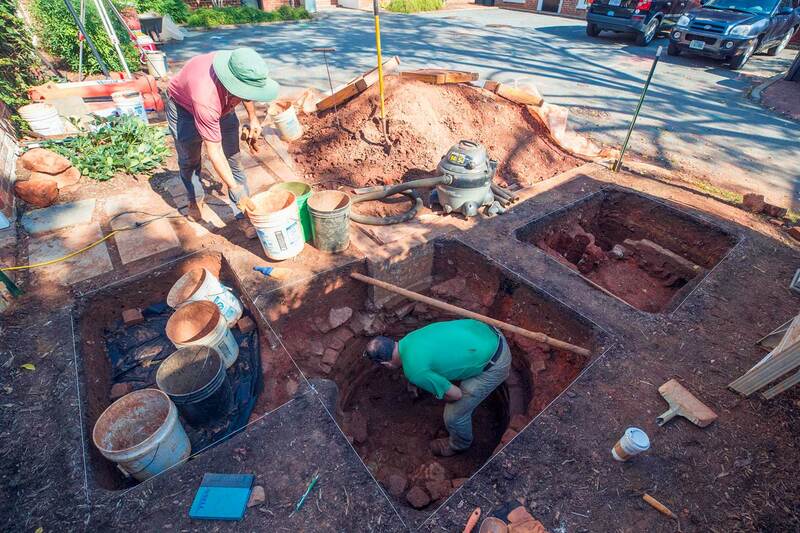 Archaeologists are excavating a mid-19th-century well next to Pavilion IV, the first one found in the University of Virginia’s historic Academical Village. “We’ve found cisterns and wooden water pipes, but this is the first well,” said archaeologist Benjamin Ford of Rivanna Archaeological Services, which is excavating the structure. The well – a round, brick structure about four feet in diameter, with an as-yet-unknown depth –was discovered on the north side of the pavilion, in the southeast corner of the parking area, in what had been an empty mulch bed. Ford said the narrow diameter of the structure and the lack of hydraulic cement, allowing water to seep into the structure, indicate it was a well. The many cisterns found on UVA’s Grounds were lined with hydraulic cement to retain rainwater or roof runoff. 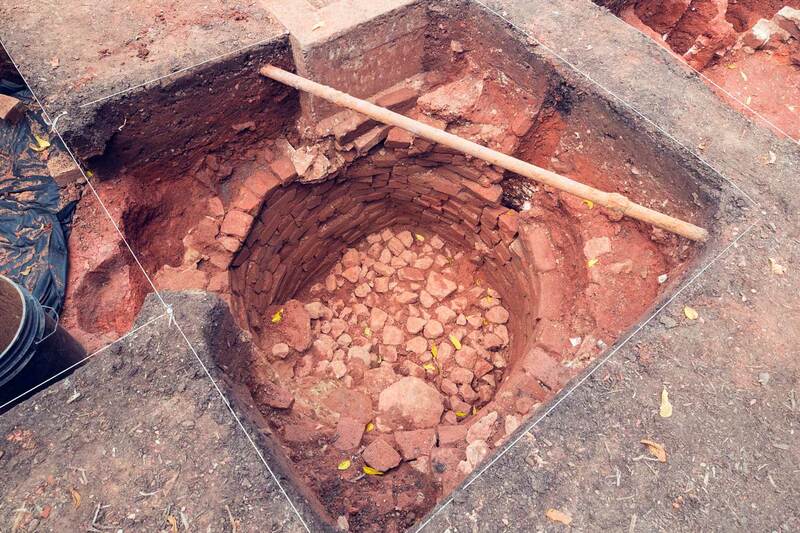 The well is an important discovery because it shows the efforts that were made to bring water to the new University. Founder Thomas Jefferson oversaw the construction of pipes to bring water from Observatory Hill to the Academical Village, water that was stored in cisterns. “This is a water source we didn’t know was there,” said Brian E. Hogg, senior historic preservation planner in the Office of the Architect for the University. Hogg said since Jefferson built his University on a hilltop, there were problems getting water to it. He said there was a spring by what is now Dawson’s Row, but there is no evidence that the University residents used it. The well apparently was not a stand-alone structure. Foundation walls found around it indicate that there may have been a mortared brick well housing that protected it, preventing soil and debris from falling into the well. Ford said this was logical since the well would have been used for potable water. The small, square structure had been shown on several maps, but the assumption was that it had another function. “Until Tuesday morning, we thought it was a smokehouse,” Ford said. He and colleague Nick Bon-Harper, a senior archaeologist, started digging out within the footprint of the small building and found the circular brick structure. Ford estimated that the well was dug before the Civil War, noting that the building around it appears on a circa-1870s map. Since there was no money to do anything during the war and its immediate aftermath, Ford believes the well may date to the pre-Emancipation period. However, it could have been used into the mid-1880s, Ford said, before the University connected to a municipal water supply and sewer system around 1885. “The University would have had a new reliable source of water, so it is likely that the wells fell into disuse,” Ford said. Aside from the four walls of the well housing, archaeologists found the foundation of another wall, which indicated that an extension had been put on the well housing. When the well was closed off, it was filled with stones. The top two feet of the fill were bricks, many of which apparently came from garden walls; Ford said that they found a quantity of coping brick, designed specifically to top the garden walls. Sarita M Herman, historic preservation project manager for UVA’s Facilities Planning and Construction, said the bricks would be cleaned and preserved and used to repair the tops of garden walls in the future. Ford said the coping bricks found in the well came in three different sizes: small, medium and large. Several feet below the brick fill were significant quantities of stone. Ford said the concentration of bricks and stones in a filled-in structure suggests it was closed off during a period of large construction or demolition. The foundation walls of the well housing and the extension were partially removed to accommodate a boxwood tree that was planted there in the 1920s. An underground electric conduit line crosses the area where the boxwood had been planted. The boxwood was removed during the past decade and a new planting was planned for the spot, which prompted the archaeological exploration. “We are planning to put in some new plantings as part of the East Range stormwater project. These might have impacted archaeological evidence in this location, so we decided to dig and check,” Herman said. Ford said the location of the well was logical, close to a pavilion to supply it with water. The area apparently has a high water table and he noted that recent residents of Pavilion II had complained about the brick walls on the lower level wicking up ground water and ruining the basement plaster. He said a shallow water table would have allowed the well to fill. Ford and his crew stopped digging in the well at about four feet below ground level, reasoning that if they are to dig any further, they will need to shore up the sides of the well structure. He said he does not know how deep the well goes, but that with shallow bedrock under the ground in that area, and a possible high water table, it may not extend much farther below grade. Ford said the soil in the well is sandy and moist. There is a possibility that if they continue digging in the well, they may get some water seeping back into the structure, he said. A decision should be made in the next several weeks how to proceed with the excavation.